So leaving Montreal for a moment, then you have Barcelona. 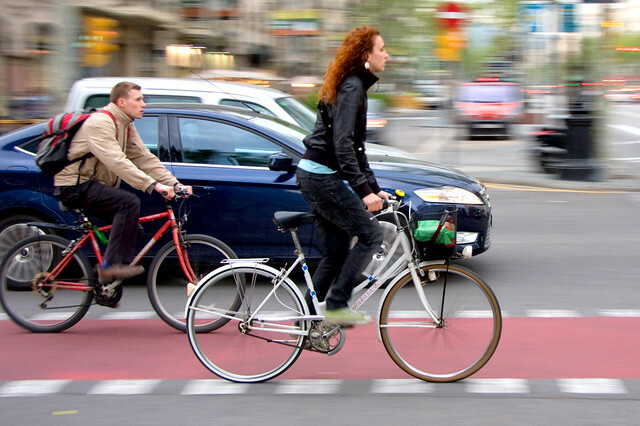 A city that puts a thousand other cities to shame for how they have managed to plant fertile bicycle culture seeds and are tending a lush and growing garden. 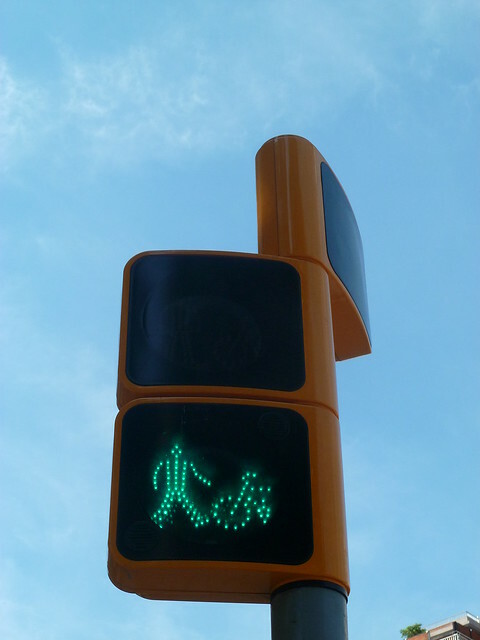 Traffic lights for bicycles are nothing new, but I love these shiny, new versions in the city. Every city is unique in their layout, needs and solutions. 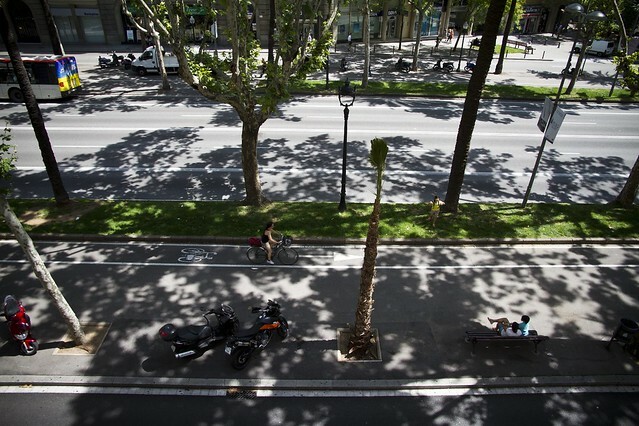 Barcelona has many incredibly narrow streets but they also have grand boulevards like the one above, Diagonal. 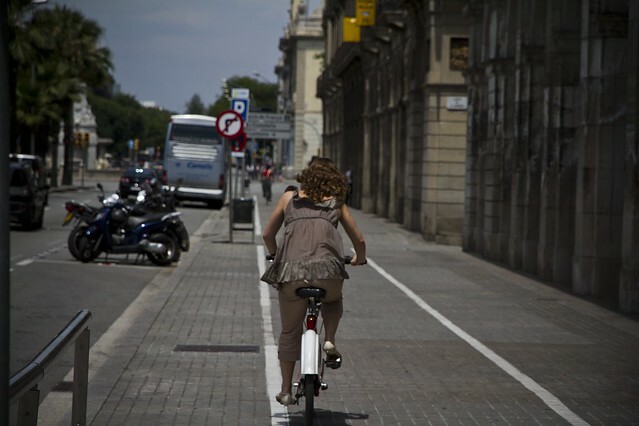 Side street, sidewalk, bike lane, main boulevard and then repeat on the far side. The bicycle infrastructure in the city is far from perfect, far from Best Practice, but my god it is well-used by the city's Citizen Cyclists. 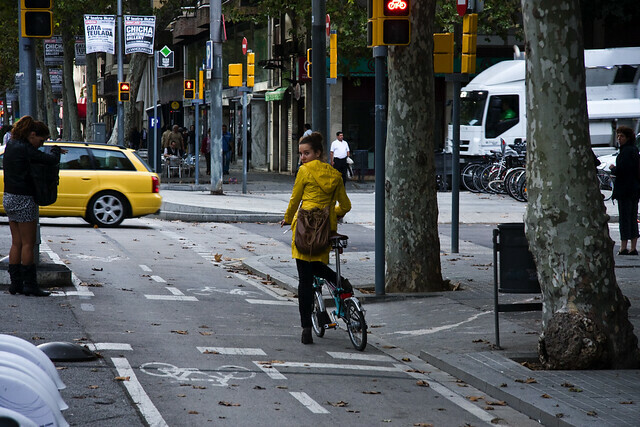 You'll see a rush hour for bicycles in Barcelona that would be considered an alien sight in most cities in the Anglo-world. Those pesky on-street bi-directional lanes are in place on many streets and while they are far from optimal, they are really used and send positive symbolism. Most of the bicycle users in the city are regular citizens who aren't out to pump up their testosterone levels so the pace is civilised. What's more, riding around the city you really get the feeling that the motorists are adapting well to seeing so many bicycles on the streets. On this street, and many others, these blocks are used to separate the bike lanes from the street and prevent cars from driving in them. 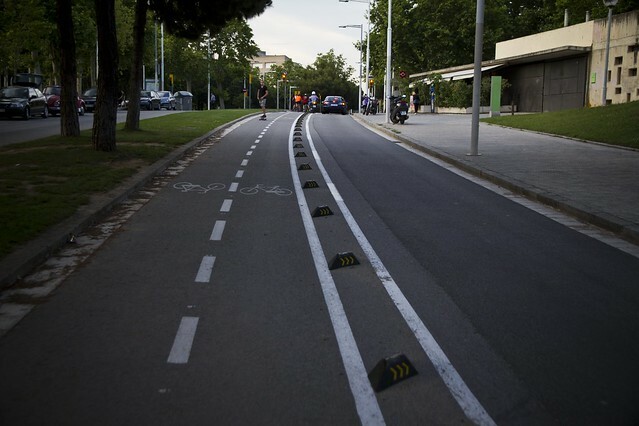 My local friends say that especially in the morning there are delivery trucks parked in the lanes on commercial streets but I never saw one car in a bike lane. 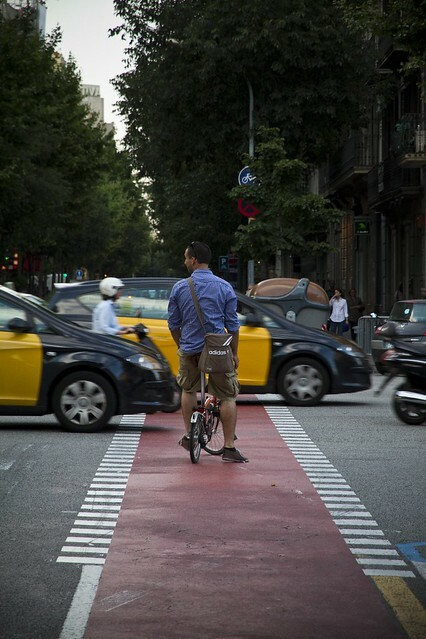 Barcelona has painted lanes across intersections, like many cities in the world these days. Combining bicycles with trains is also incredibly simple. 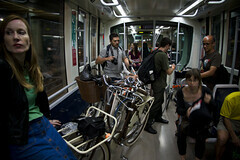 The crew from the Cycle Chic Bloggers Conference headed by train from Plaza Catalunya to the small city of Saint Joan Despí, about 10 km away. 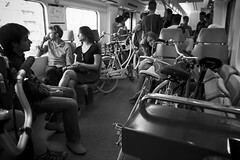 My first question was whether so many bicycles were allowed on the train. My Barcelonan friends just shrugged. Sure. Why not? We didn't even need a ticket for the bicycles. We ended being about 20 bikes in two cars on the train for the trip. Brilliant. On the trip back from Saint Joan Despí we took the tram to Barcelona. Again, all of the bicycles fit on board, no ticket was required and nobody minded that we took up a bit more space than normal. Not even the conductor who came on board to check tickets. 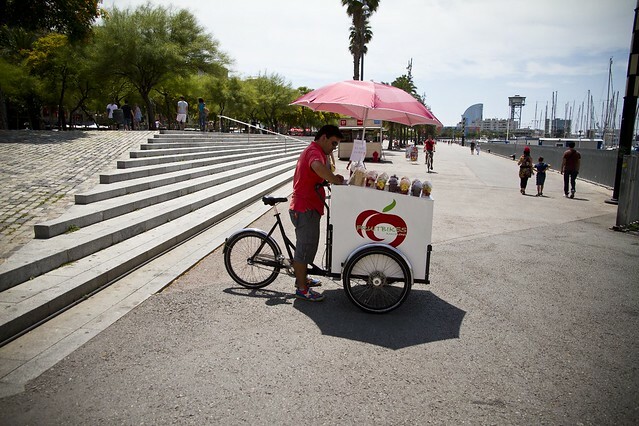 And what could be better than seeing a cargo bike selling fruit by Port Vell?! And a Christiania Bike, no less!